When it comes to urgent care, West LA residents should never settle for anything less than the best. Unfortunately, at many hospitals and other facilities for urgent care in West LA, patients must suffer through long wait hours and exposure to the germs of other patients. Further still, the commute to a 24 hour medical clinic in Los Angeles can often be a major frustration – particularly when you're suffering from an illness or injury. 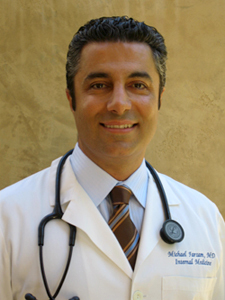 That's why so many patients have come to rely upon the medical concierge services offered by Dr. Michael Farzam – the premier House Call Doctor Los Angeles. The idea of doctor house calls might seem antiquated to some – but the truth is, in today's fast-paced modern world, the personalized, convenient care of a house call doctor is more important than ever. Dr. Farzam's medical treatment stands out even among house call internists. In fact, our lead medical professional has been voted 'Best Doctor', and has even received prestigious 'Patients Choice' and 'Patient's Recognition' awards. For some, the utmost discretion is required for their urgent care in West LA. Fortunately, Dr. Farzam will treat patients for acute illness, ear, nose and throat ailments, pregnancy testing, puncture wounds, STD evaluation, cold sores and much more from the safety and comfort of their own homes. Further still, all of our services for urgent care in West Hollywood are available to employees at their desks, in their hotel rooms, or nearly anywhere else that they feel the most comfortable. Even if you don't currently have insurance, or you have a health plan but you don't have access to a qualified physician to treat your needs, you can always count on Dr. Farzam and the team at House Call Doctor Los Angeles. Whether your health requires urgent care in Pacific Palisades, West LA or anywhere else in the greater LA area, find top medical care from the comfort of your home.